The Australia-Pacific plate boundary is over 4,000 km long on the northern margin, from the Sunda (Java) trench in the west to the Solomon Islands in the east. The eastern section is over 2,300 km long, extending west from northeast of the Australian continent and the Coral Sea until it intersects the east coast of Papua New Guinea. The boundary is dominated by the general northward subduction of the Australia plate. 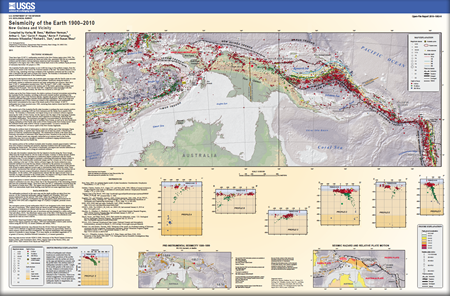 Benz, H.M., Herman, Matthew, Tarr, A.C., Hayes, G.P., Furlong, K.P., Villaseñor, Antonio, Dart, R.L., and Rhea, Susan, 2011, Seismicity of the Earth 1900–2010 New Guinea and vicinity: U.S. Geological Survey Open-File Report 2010–1083-H, scale 1:8,000,000.